• CREATE ROSES AND TULIPS IN SECONDS. • DISHWASHER SAFE - Easy to wash.
• MADE OF premium quality 304 Stainless Steel. • FOR ANY cake decorator, home baker or culinary school grad. - Makes an Excellent gift for any occasion - birthdays, holidays, housewarming etc..
- Pair with our single coupler 4-pack and extra 10 disposable bags kit, for the perfect gift bundle. - It comes in a storage container size 7" x 4.5" x 2". 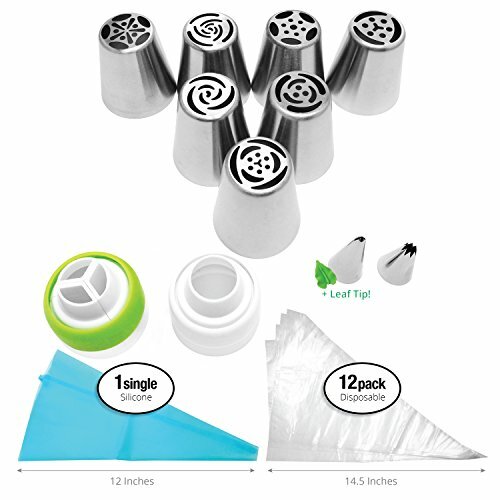 The tips bottom diameter is 1.5" and the height is 1.7"
Your risk is completely eliminated when you order today. You are protected by a 60 day, no-questions asked MONEY BACK GUARANTEE and world class customer service! Enjoy the Complete Decoration Experience Now!! Take Advantage of our introductory sale price - This offer is only valid for a limited time Order NOW. ✔️ INCLUDES EVERYTHING YOU NEED - MOST POPULAR 7 Russian tips, 1 Leaf tip, 12 Disposable piping bags, 1 Silicone Reusable piping bag, 1 tri coupler, 1 single coupler, BONUS Cake tip. Includes Storage container. ✔️ MAKE FLOWERS AND LEAVES - Create beautiful Tulips, Roses and other flowers in seconds, COMPLETE with Leaf tip, creating stunning floral designs on your cakes and cupcakes. Our Junior "test kitchen" calls them - happy bakes flower nozzles. ✔️ EASY TO USE - SAVE TIME with our PDF Instructions, recipes and Online Instructional Videos. See AMAZING results in no time. ✔️ PREMIUM QUALITY - SEAMLESS one batch molding, no welding, no cracking, WILL NOT BREAK and easier to clean. 304 stainless steel. ✔️ GREAT GIFT - IDEA for any cake decorator, home baker or culinary school grad. UNIQUE Housewarming or Wedding Gift. Only Jonus & Bimar can offer manufacturers warranty - WILL WORK AS DESCRIBED - OR WE WILL SEND YOUR MONEY BACK. If you have any questions about this product by Krierah, contact us by completing and submitting the form below. If you are looking for a specif part number, please include it with your message.